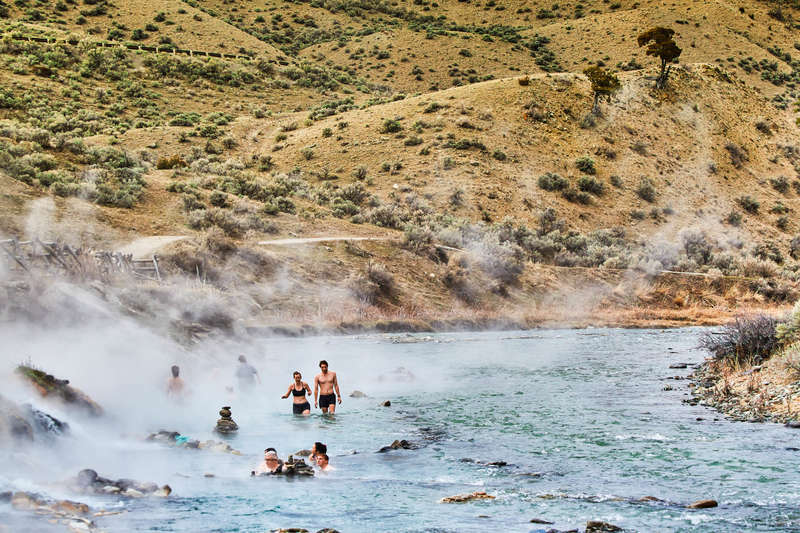 If you're even thinking of being in Yellowstone, check out the rest of our DestiNATION Yellowstone travel guide. It's stacked with expert advice on what to do, where to eat, and how to get around America's wildest national park. Yellowstone is a park for all seasons. Its famously dynamic ecosystem and underlying geology means each successive season is distinct not just from the one that came before it, but from what it was last year, too. Geyser eruption patterns, wildlife hangouts, the shapes into which things freeze and thaw -- every time you go to Yellowstone, you’re going somewhere new. While the park boasts some truly astounding attractions that you can see without really leaving your car, the best way to experience it is to get out and get active. 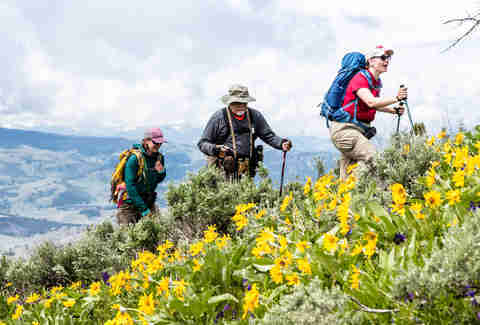 If you’re an avid hiker looking to hit Yellowstone’s best trails, we’ve got a whole guide for you -- but for all you fish catchers, river rafters, animal spotters, and snowshoers, read on for the very best things to do in Yellowstone, no matter what time of year you’re visiting. Here's everything you absolutely have to do and see in Yellowstone National Park. 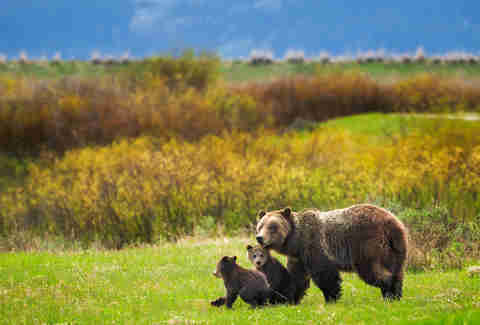 In April and May, the bears of Yellowstone come out of hibernation, and with them new cubs. Bison calves are being born on the plains, and bighorn lambs up on the cliffs. Birds pass through on their migration routes; frogs call loudly in ponds. Roads that closed during winter -- which is almost all of them -- start opening back up, as do four of the park’s 12 campgrounds and most of its lodges. Around April, most of the park’s seasonal employees and volunteers will start getting back into the swing of things. If you’re bringing your kids to Yellowstone, there’s a strong case to be made that spring is the best time to visit, what with all the frolicking baby animals and shorter lines. Moms and pops, try to work things out with the school schedules and check out the springtime packages geared toward families. Bears, bison, elk, sheep, moose, wolves -- pretty much anything covered with fur is more fun to look at when it’s cute and little. Your greatest odds for animal sightings are at dawn and dusk. Head up to Slough Creek, where most years there’s a wolf den. 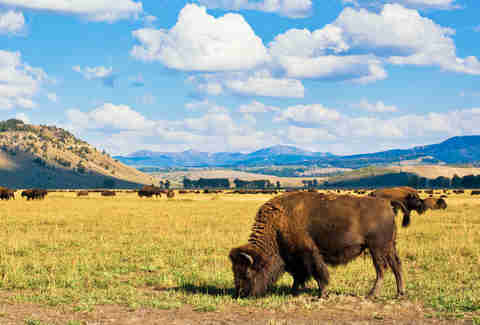 For an easy payoff, park your car at a pullout along Hayden Valley to watch the bison calves. If the herd isn’t there, it probably will be the next day. For an absolute slam dunk, go up to Mammoth, where there are elk on the lawns pretty much all the time. They’re probably the least skittish animals in Yellowstone, unfazed by humans in the grand tradition of city pigeons or feral cats. Still, remember the elk are wild -- always keep a safe distance, ideally 25 yards (although getting closer is kind of inevitable since they’ll literally just be in your walking path). The single most ecstatic person I saw during my trip to Yellowstone -- or in my entire life, really -- was a little kid getting sworn in as a Junior Ranger at the Grant Village visitor center. I was a Junior Ranger myself once (at a different national park), and it truly is one of the most fun and immersive ways to get your kid into nature. All visitors centers have Junior Ranger activity booklets ($3) for kids aged 4 and up. To earn a Yellowstone Junior Ranger patch, each tiny cadet needs to hike a trail or boardwalk (with you in tow, not, like, all by themself), complete the various booklet activities, and attend at least one Ranger-led activity (a daily talk perhaps, or an evening campfire). Here are the full details. There’s also a Young Scientist Program (ages 5-9) that involves solving ~mysteries~ in a series of small, self-guided adventures to be completed around the park. You can pick up the booklet ($5) at either Old Faithful or Canyon; aim for Old Faithful so you can pick up the Young Scientist Toolkit at the same time. Summer in Yellowstone is peak season. June is when the crowds start to pour in for real (summer vacation ‘n’ all) and July is the Yellowstone’s busiest month of the year. 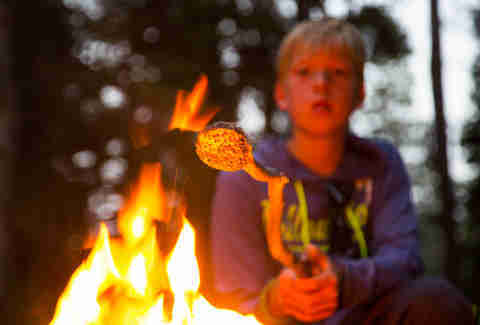 The weather is at its most comfortable, although it can still get down to the 30-degree range at night, even in August. All things considered, this is the season with by far the most things to do -- so let’s get right to it. Summer is the best time to hike in Yellowstone, and not just because the weather is at its most well-behaved. Many parts of the park are only open between Memorial Day and Labor Day (roughly), and many trails aren’t sufficiently clear of snow until mid or late July. Also, you want the bears to be neither starving (like they are in spring) nor attempting to double their body mass index (like they are in autumn). And yes, hiking is indeed the most popular activity on this list by far, which is why we’ve taken care to address it all on its own: Check out our complete guide to hiking in Yellowstone here. You’ll need a Yellowstone-issued permit (state-issued ones won’t do) which you can pick up from the same places as the boating ones, plus local fly shops. They’re $18 for three days, $25 for a week, and $40 for a season. And be sure to check in on the restrictions surrounding certain species of fish and various regions of the park -- you can find them here. Motorized watercraft are allowed on two lakes in the park: Lewis Lake and Yellowstone Lake. The other lakes are limited to kayaks, canoes, and such. River-wise, the only one open to kayaks and canoes is Lewis River, so the move here is to paddle from Lewis Lake up through the Lewis River channel that connects to Shoshone Lake (be prepared to drag your boat the last little bit if necessary, as it gets pretty shallow). You will need a permit, which you can get from visitor centers, backcountry offices, or general stores; they cost $5 per day or $10 per season for non-motorized vehicles, and $10 per day or $20 per season for motorized ones. 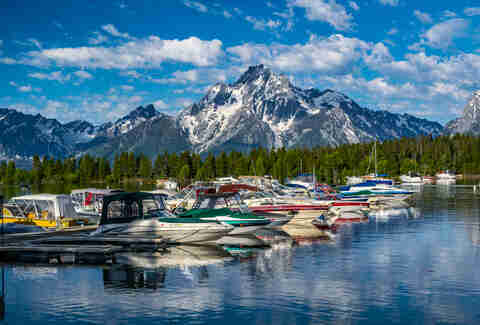 You can also book fishing and/or sightseeing charter boat tours from Yellowstone National Park Lodges, which cost around $95 per hour. Guided trail rides are around $55 for an hour or $75 for two hours. Roosevelt Lodge, which also offers stagecoach tours, offers rides in an especially beautiful area of the park, with rolling hills and waving grasses. Like a lot of the non-boating and non-fishing crowd, I’d assumed swimming in Yellowstone was prohibited. But while it’s not really advertised, you can legally swim just about any place there’s enough water to do it (the exceptions being the hot springs, where you’ll definitely want to avoid the boiling pits of sulphur). You don’t see many people swimming in Yellowstone partly because people don’t know they have the option, but mainly because the water is extremely cold, even in summer. The picnic area at Lava Creek Trail is a (relatively) popular spot for taking a cold dip, but there’s also a handful of naturally warm thermal sites -- try Boiling River (north of Mammoth) and Firehole Canyon Drive (down by Madison). You’re safe from any unpleasant things like leeches or snapping turtles, although there is technically a brain-eating amoeba that you could contract in the warm water. Don’t worry though, there have never been any reported cases of swimmers contracting it -- park rangers just advise not dunking your head. Fall is the least-hyped time of year to visit Yellowstone, but this is more a failure of PR than of the actual season. There are fewer activities on offer than in summer or winter, but visually the park is at its most spectacular. Late September to early October is usually the sweet spot for foliage, and that’s also when the crowds are conveniently thinning, so you won’t have cars blocking your view of the aspens turning to gold. Some hotels within the park close after August, so be sure to check the dates in advance if you prefer not to stay in one of the nearby towns, like Gardiner, Montana. Fall travel packages are available if you want to check those out, too. Early autumn means it’s the elk’s turn to rut, and if you think elk are boring you’ve probably not yet heard them bugle. The bulls, crazed with testosterone, will sometimes chase cars, so remember (as always) to be alert and not get closer than 25 yards. Keep an eye out for them along the Hayden Valley and up near Mammoth. Brown trout are spawning this time of year, and both the Madison River and Gardner River are full of ’em. Some of Yellowstone’s most breathtaking sights are also, understandably, some of its most crowded. That’s summer, though. Grand Prismatic Spring is great, but it is greater when you are not being cut off by strangers and elbowed by children who are not yours. Not only does everything become spectacular come fall, it also becomes quiet. Check out our complete guide to Yellowstone’s best sights you can see without really leaving your car. Fall is perfect for those of you with the heart, in both the physical and emotional sense, to get around Yellowstone by bike. Bike routes are open when the roads are, but also for a bit of bonus time before the roads open up in the spring and after they close in the late fall. Yellowstone National Park Lodges only rents bikes at Old Faithful through Labor Day, but you can pick them up from local shops. Free Heel and Wheel in West Yellowstone rents bikes for $10 per hour or $35 per day. You can take a look at the bike routes here. Frost-covered bison, their breath steaming the air, are in the top tier of iconic Yellowstone imagery. 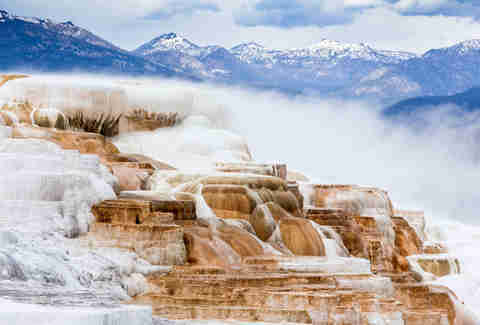 There’s a reason so many of the postcards and promotional pics for the park show Yellowstone during the winter, even though its most popular season is summer. Yellowstone is beautiful and severe at this time of year, the waterfalls frozen and the roads unplowed, and you must see it for yourself. Many hotels and restaurants in and around Yellowstone stay open during the winter, but what changes is how you reach them. Because the roads are closed, your main option for getting around between early November and mid-March is oversnow transport like snowcoaches -- basically, van-like snowmobiles. Skiing is an activity, sure, but it’s also a common and perfectly acceptable means of getting from Point A to Point B when the roads close down. All unplowed roads are open to skiing and snowshoeing, though one will certainly get you where you’re going a bit faster than the other. Lots of people bring their own gear, but you can easily rent -- Parks Fly Shop up in Gardiner will set you up with regular cross-country skis for $20 per day, backcountry skis (don’t forget to get a permit) for $25 per day, and snowshoes for $15 per day. 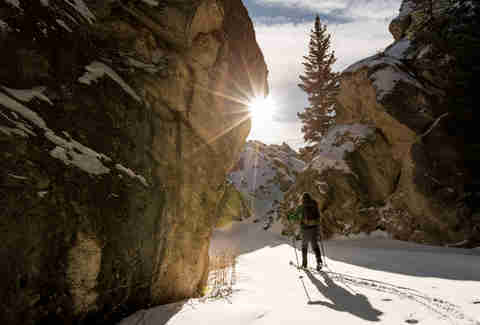 There are also loads of National Park Service-approved guided tours on offer for both skiing and snowshoeing. Full-day snowcoach tours with Safari Yellowstone start at $150 per day. You can choose from routes that focus on Old Faithful, Grand Canyon, or Lake Yellowstone. While you can see wolves in Yellowstone throughout the year, winter has an edge because the snow makes the animals easier to spot. Plus, there are fewer people than in summer. 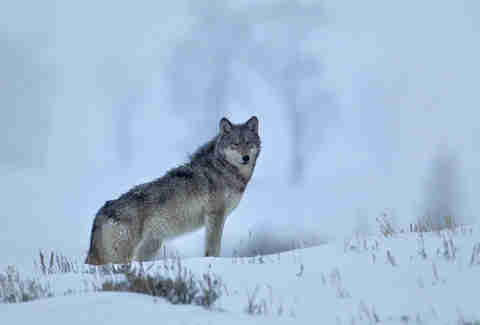 Wolf & Wildlife tours from Safari Yellowstone are $350 for a half day and $500 for a full day. 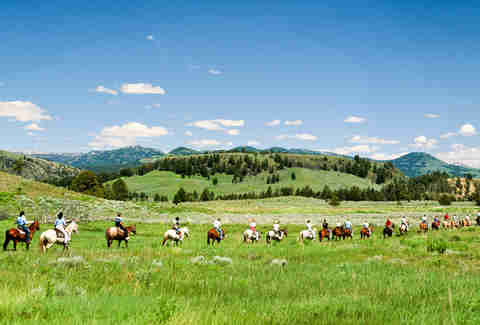 Or if you prefer to try your luck independently, head down into the Lamar Valley -- particularly at dawn and dusk. You don’t have to be on a guided tour to cruise around by snowmobile. Come August, enter the lottery to get a Snowmobile Access Program permit -- the application costs $6, and the permit itself $40 per day. The lottery allows four groups into the park each day, and if you don’t make the cut when you first apply, keep checking back in for cancellations.